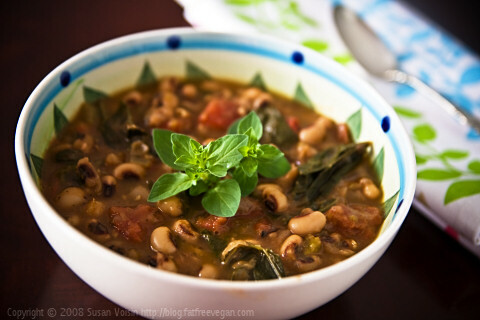 This collards and black-eyed peas soup is spicy, smoky, vegan, and low-fat. 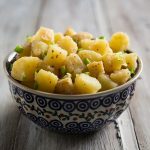 Make it quickly in the Instant Pot or pressure cooker! So in the end, I took an old favorite soup, Lorna Sass’ Collards and Black-eyed Pea Soup, and gave it the Louisiana treatment: green bell peppers, diced tomatoes, creole-type seasonings, and loads of spiciness. 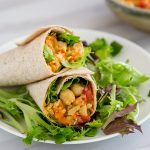 And since I love smokiness, I kind of went wild with three different smoky seasonings–chipotle powder, fire-roasted tomatoes, and smoked paprika–and my husband and I loved the results. I know that not everyone is the smoke addict that I am, so if you like spicy but not smoky, just substitute regular chili powder, regular diced tomatoes, and regular paprika. 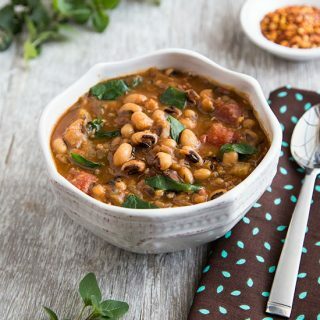 If you’re making this for New Year’s Day, note that it covers both of the “lucky traditions”: black-eyed peas and greens. 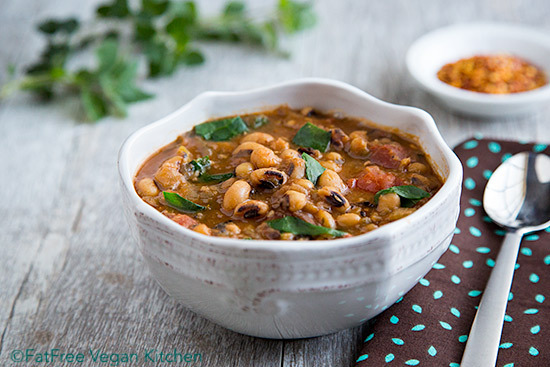 It’s a one-pot healthy start to the new year! If you don't like or can't find collards, feel free to substitute your favorite greens. Quicker-cooking greens such as spinach should be added right at the end of cooking. Heat a pressure cooker or large pot and add the onions. (Electric pressure cooker users, use Sauté or Brown setting.) Sauté for about 5 minutes, until they begin to brown. Add the celery, green pepper, and garlic, and cook, stirring, for 3 more minutes. Add the black-eyed peas, water, 1 teaspoon of the thyme, and 1/2 teaspoon of oregano. Cooking: If using a pressure cooker, seal the cooker and cook for 10 minutes after it reaches high pressure; use a quick-release method to bring down the pressure. If cooking in a regular pot, cook until peas are tender, about 45-55 minutes. Thank you for this recipe. I had an aversion to collards until recently (when I read about their nutritional benefit) so I have been looking for good recipes for them. This fits and I am pretty sure they will disappear rapidly out of the pot. Thanks again for all you do. Question after initial cooking with peas then add collard greens and spices and put back in pressure cooker on low for additional time? Yes. All the details are in the last step. Thanks for this marvelous recipe -a new twist on the traditional peas and greens! OMG! 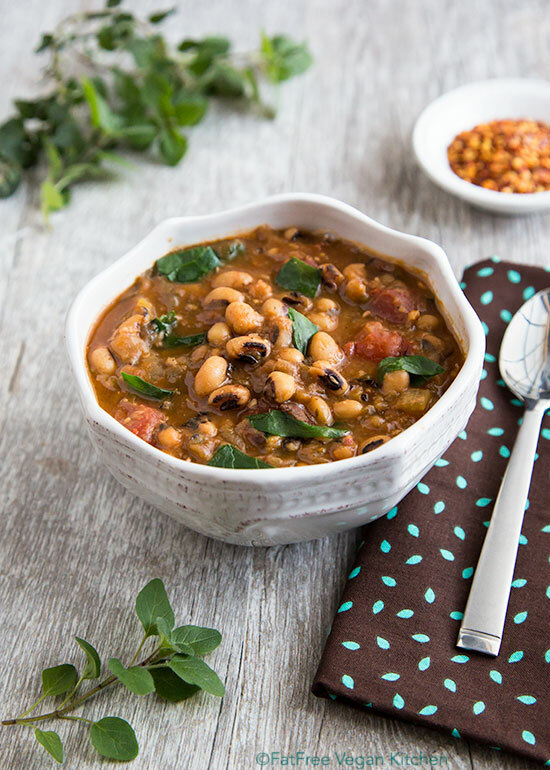 I made this today and this is the absolute best tasting black eyed pea recipe! I don’t particularly like black eyed peas, but I eat them every January 1st. Not being vegan, I used chicken broth instead of water and added kielbasa sausage. I used smoked paprika instead of smoked Spanish paprika. You’ve created a perfect combination of flavors- thanks!! Made this in the Instapot for New Years Day good luck. It was SOOO good! Thank you! Susan, just tried this and it is delicious! Thank you for your consistently high quality recipes. This was unbelievable delicious! It is a favorite that I will make often. omitted the hot sauce and the spice level was perfect; not too hot. I served it over some mashed potatoes with cornbread muffins and a small salad. Wow! What a delicious meal! Thank you!!!!! I made this a couple of months ago and froze the leftovers for lunches. I thawed a serving overnight in my fridge and brought it to work for lunch. While I was thoroughly loving it again as I ate it at my desk, a co-worker approached and asked me what smelled so good. 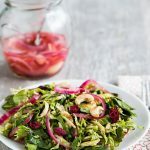 This truly is a fabulous recipe! What a fabulous recipe, Susan! I just returned to WW and this was my first really excellent, low/no point recipe – one I plan on using more than once throughout the year. Love your recipes – thanks for all the hard work you do to encourage healthy eating. Thank you! And welcome back to Weight Watchers! I’ve been trying to get Freestyle points on more of my recipes. 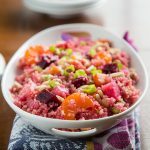 I have a category for zero point recipes— https://blog.fatfreevegan.com/category/zero-points —and a tag for all recipes that have points calculated— https://blog.fatfreevegan.com/tag/weight-watchers-points. Happy new year!